A lot of things has been written about nginx and Apache : proxy_pass, proxy_redirect, subdomains... I just want to publish my configuration that is in test but works. 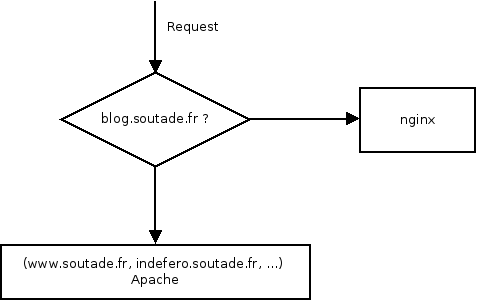 This is a response to my requirements : I want nginx to serve the subdomain blog.soutade.fr but transfer all other requests to an Apache server (soutade.fr, www.soutade.fr, indefero.soutade.fr ...). And restart bind : sudo service bind9 restart. root.soutade.fr. is the mail address of the administrator. Now everything might be ok.